Jim Seymour has been interested in weather since he was a little fella in Central Iowa. "My father was a bombardier and my mother was a WAVE," Seymour says. "During World War II, my mother taught free gunnery in the Navy, but she also taught meteorology, and she still had some of her meteorology manuals around, and that's where I got interested originally in meteorology — when I was a kid." His interest in weather patterns, precipitation levels, cloud coverings, and temperature maximums and minimums continued throughout his life. These days, at 10 till 8 each morning, Seymour can be found checking the weather, precip levels, and max and min temperatures from his home in the heart of Prineville. By 8 a.m., he has recorded the data on the National Weather Service's online portal. Seymour's figures populate a number of weather sites, including National Oceanic and Atmospheric Administration and AccuWeather. Just how he landed his latest volunteer role began when he was a youngster. "I wanted to go into weather when I went into the service, but they decided I wanted to be a computer programmer," Seymour recalls with a chuckle. After dutifully serving as a computer programmer for the Air Force regulars, he settled in Denver, Colorado, and joined the Air National Guard. When they had an opening in the weather department, he was finally able to work in weather. He spent 1971 to 1980 in air weather service in the Colorado Air National Guard at Buckley Field. He had quit his job as a computer programmer in 1977 to go to college and continued in the Guard to help supplement the GI Bill checks. Because of his background in programming, when he was at Colorado State University, the Air Force Reserve Officer Training Corps offered to send him to Missouri Institute of Technology if he went back into the Air Force in weather simulation. "I didn't want to spend the rest of my career in Missouri," Seymour chuckled. He ended up working as a hydrologist with the Forest Service for about 30 years. Seymour and his wife, Sandra, moved from the Olympic Peninsula to Prineville in January of 1992. He worked as a hydrologist for the Ochoco National Forest until retiring in January 2010. As a hydrologist, he maintained water quality for various activities and was responsible for water rights. "We keep the mud out of the creeks when we were logging timber and maintaining water temperature," he explained. Seymour believes the Weather Bureau, now named the National Weather Service, has been keeping weather records for Prineville since the 1880s. For many years, the folks at the local Forest Service had been in charge of collecting the data for the National Weather Service in Pendleton, which is part of the National Oceanic and Atmospheric Administration. But in July 2017, the main data collector retired, some funding stopped, and Prineville no longer had a local weather reporter. 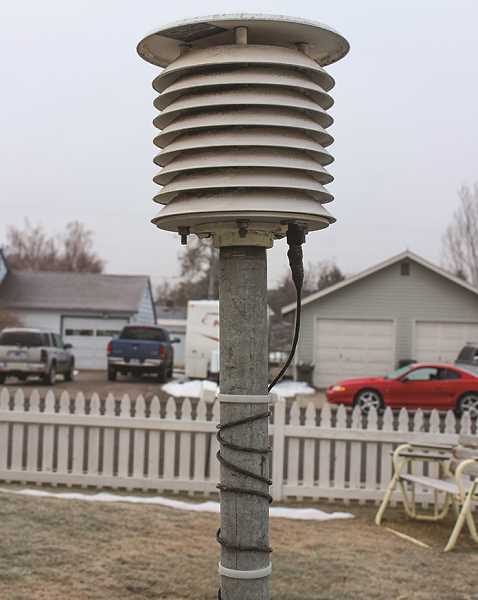 In the fall of 2017, Seymour saw a notice in the Central Oregonian that the National Weather Service and National Oceanic and Atmospheric Administration needed a Prineville weather recorder. NOAA is an American scientific agency within the United States Department of Commerce that focuses on the conditions of the oceans, major waterways and the atmosphere. 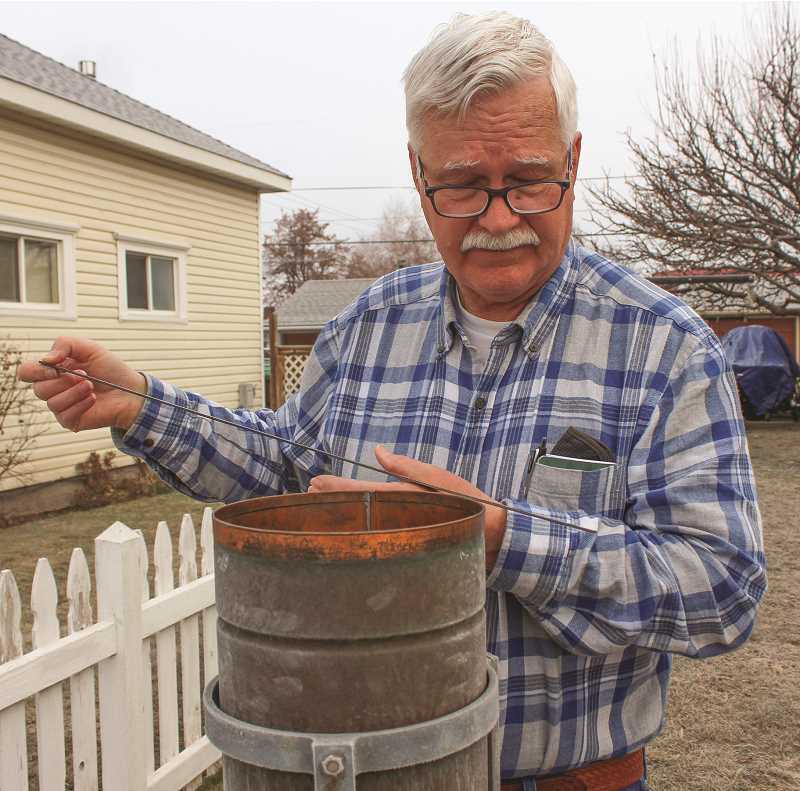 The National Weather Service hired Seymour for the volunteer job and installed a temperature sensor and precipitation gauge in his yard on the west side of his Southeast Second Street home. His first reading was Oct. 31, 2017. Each morning, just before 8, he uses a special measuring stick to check the precipitation level inside the precip gauge, which looks like an old artillery shell. When it snows, he has to melt the snow in order to determine the amount of moisture in the snow. "Unless you've had snow that's already melted or you've had rain mixed with snow, you'll usually figure that the snow for that day is about 10 times more than what you would get for the precip," he explained, admitting that it's not really very high-tech. Lately, he's also had to measure snow depth. 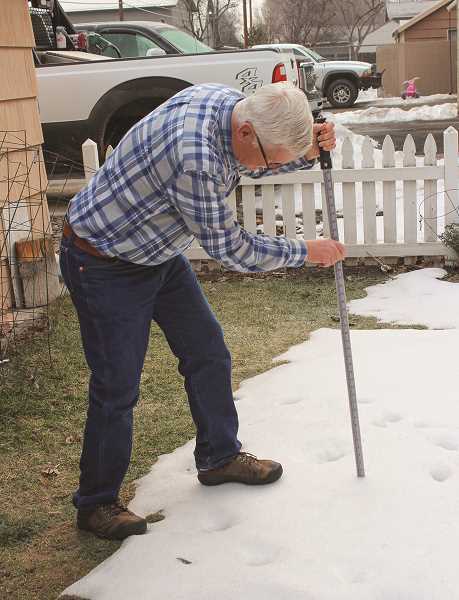 Using a measuring stick, he takes measurements in several areas and averages the snow depth, recording snow accumulation. When snow is forecast, he sets out a snow board, which is basically a white board. He then measures the daily snow accumulation, clearing the snow board after each measurement. Next is the temperature sensor. It detects the current temperature and stores the minimum and maximum temperatures in a 24-hour period. The sensor is wired to a digital device inside the house. Each morning, Seymour records the minimum and maximum temperatures. Finally, he observes the current weather, noting any clouds, fog, hail, wind or other occurrences. He also reports the visibility if there's fog, using landmarks to determine the distance. At the end of each month, he verifies the observations. Occasionally, his wife will collect the data if he's unable to, or if they are out of town, they have two neighbors who have learned process. "The most technical thing somebody really has to do is reading the dip stick and getting into the computer to the website," Seymour laughs. "Most of us have laptops anymore — even us old people." So when you see last week's temperatures and precipitation levels on page 3 of the Central Oregonian or check AccuWeather or NOAA's websites, you can thank Prineville's own volunteer weatherman. "I always liked weather, and it sounded like something good to do. It gave me a reason to get up in the morning," Seymour chuckles.